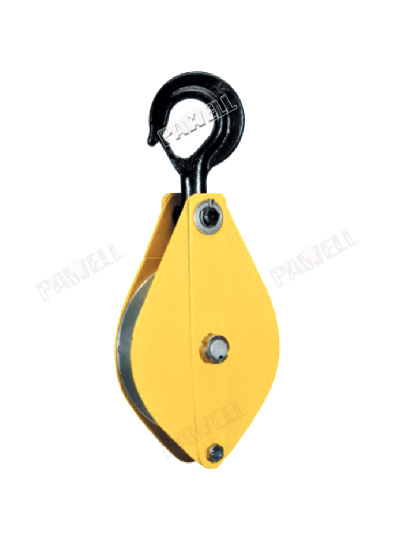 Pulley blocks, hinged, with single steel sheave Capacity 500 - 6400 kg One side of the pulley blocks is hinged and can be opened for easy and quick positioning of the wire rope on the sheave. 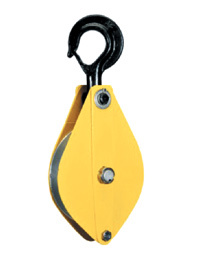 It can also provide a quick and versatile rigging point or redirect a wire rope. 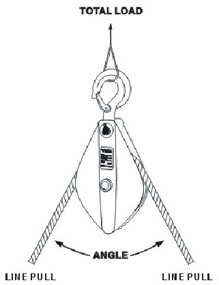 • Swinging the hook in the direction of pull securely locks the pulley block. • The high quality cast steel sheaves have machined grooves. Item Code. 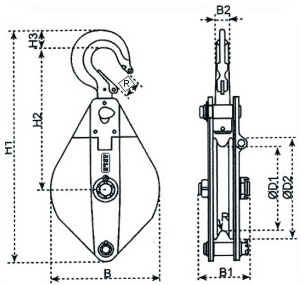 "223###" is heavy duty type. Copyright © 2013-2014. PAWELL MACHINERY MANUFACTURING INC.
292W Clifton ST.Tampa. FL. 33614 USA.